Every Friday is good! Pretty simple conglomeration today. The dress shirt is another Lands End. It's a pinpoint straight collar blue Bengal stripe. 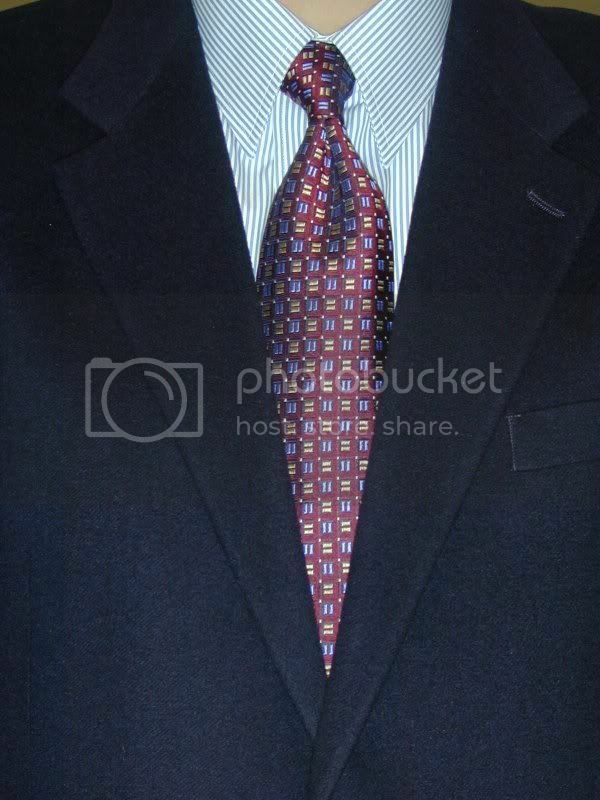 The necktie is an Ike Behar with a maroon background. The rectangles are blue and gold. I topped it all off with the navy sportcoat. Hope everyone has a fun Easter weekend. I'm on the way out the door to drive to my home town through a snow storm. Hopefully the roads will hold up for a few more hours. Excellent! And thank you. I have read your blog quite often and I don't quite know why I didn't link to you earlier. I have also added you. I got quite a laugh from your comments on outfit vs. ensemble vs. conglomeration. I did have a very good Easter although the weather did not cooperate at all. Hope yours was at least as good as mine!